To get to the high points of St. Petersburg and explore the brilliant sights from an unusual angle. St. Petersburg is built on a flat, not marked by rise, hills, cliffs. The hollow mountain in Ozerkakh is the only hill in the city, has a ridiculous height of only 42 meters. Because of its planar arrangement and strict geometric layout, St. Petersburg seems to be like a chess board. But this is only a superficial impression of a pedestrian who studies the Northern capital from its height. When you change the angle and look at the city from the top point it is perceived completely differently. At the top there is no tram bells, rustling tires and grinding brakes, there does not seem to be a rumble of the continuous movement of human crowds. All the vanity remains below, the winds are blowing around and pigeons fly, and under the feet the city of triumphal arches and ceremonial, imperial buildings and Stalin underground stations, lush facades and gloomy courtyards lies. For the sake of seeing St. Petersburg from the height of the bird's eye, it is worth visiting the northern capital on the weekend and climbing the rooftops and towers, colonnades and bell-towers. Who does not want to admire the city from above, rising above the urban fuss? The view from the roof is a powerful energy, great impressions and, of course, wonderful photos. Ruffers drive along the roofs of the central part of the city in the Nevsky and Ligovsky Prospekt, Marat, Sadova and Rubinshteyna streets, even rising to the Admiralty buildings and the General Staff. The most famous point of view is the colonnade of St. Isaac's Cathedral. Entering in, we touch powerful granite columns, admire the mosaics, and listen to the unearthly voices of the church choir. The door to the right of the main entrance leads to a spiral staircase. You do not have to strive to overcome one breath of 300 steps leading up to the dome. Stand, change the spirit - and do not hurry up the platform, located at an altitude of 43 meters. From the colonnade of St. Isaac's Cathedral, the whole center is on the palm. Bypass dome we see Ysaakyevskaya Square with monument to Nicholas I and Konnohvardeyskyy manege with statues of Dioscuries, hotels "Angleterre" and "Astoria", the wide blue bridge, leading to the Mariinsky Palace. From the top point the view will be opened on Neva, the Decembrists' Square and the Bronze Horseman with a laurel wreath on the head, the Senate and Synod buildings, crowned with a sailboat, the Spire of the Admiralty, the Arch of the General Staff and the flying angel at the top of the Alexandria column. It is worth a stop a look at the Palace of Prince Menshikov - one of the first stone buildings of St. Petersburg. In the distance you can see the ornamented domes of the temple of Savior on the Blood, to the right of the spire of the Mikhailovsky castle rushes upwards, behind which the toy ensemble of the Smolny Cathedral is visible. In the west, the horizon is filled with vertical arrows of port cranes. The bridges are not wide, so they are not allowed to shoot with a tripod. However, during the Soviet era, the colonnades of St. Isaac's Cathedral were generally forbidden to photograph. It is worth noting that in the summer closer to the middle of the day for tickets to Colonnade of St. Isaac huge queues line up, and above it is difficult to push through. Therefore, to approach the ticket office you have as early as possible, preferably to its opening. Another high point is on the opposite side of the Neva, in the territory of the Peter and Paul Fortress. Here you can spend all day, because Petropavlovka is a tomb of the genus Romanovs and a Shemyakin monument to Peter the Great, the Museum of City History and the Mint, Cathedral Square and the Botanical House, prison casemates and the most popular St. Petersburg’s beach. For those who wish to observe the neighborhood from above, the Naryshkin bastion is opened - a fortification, which extends to the Neva River. From here on October 25, 1917, a signal was sent to the cruiser "Aurora" about the beginning of an armed uprising. On the sloping wooden floor we will climb a powerful wall and glimpse the panorama of Petersburg, framed by two bridges - Troitsky and Dvortsovy. Ahead the Marble Palace is located – it is the gift of Catherine the Great to Grigory Orlov, and the memorial temple of the Savior on Blood opens after the palace. To the right there are gilded facade of the Hermitage, the snow-white Colonnade of the Exchange, decorated with the nose of the ships, the Rostral columns and the granite descents to the water on the Strelka of Vasilievsky Island. On the roof of the Nevsky Kurty you can reach Naryshkin bastion, where there is a striped booth of the watch. Every day at 12:00 a six-inch howitzer shoots here, telling people about the coming of noon. An equally beautiful view of Peter opens from the roof of the Loft project "FLOORS". This art-space combines a hostel, a gallery of contemporary art, many shops with all kinds of crafts, several cafes and a wonderful observation deck. From here you can see Ligovsky Prospekt with the famous Pertsov's house, domes of St. Isaac's and Vladimir's cathedrals. One more opportunity to see St. Petersburg from the height is given to the visitors of the Museum-salon of K.K. Bulla. In the house, located in the center of Nevsky Prospect, there was a photo studio, which worked even during the war. Here you can find photos of the city life in the late nineteenth and early twentieth centuries. From the balcony you can see Nevsky Prospect and the Gostiny Dvor, Ostrovsky Square and Sadovaya Street. The newest observation deck on the roof of the shopping mall "Gallery" was opened a year ago. On five floors you can find numerous shops and salons, as well as the Amusement Park, bowling and restaurant "Big Kitchen". Residents of the city and tourists can climb through the restaurant on the terrace and see as in the palm the historical buildings of St. Petersburg. Guests of the city will also be pleased with the location of the shopping center "Gallery" - it is a 3-minute walk from the Moscow railway station. Let's go down to the metro and we will reach the station "Chernyshevskaya", and from there we will go on foot to the Smolny Cathedral. In a picturesque place where Neva makes a steep bend, in the times of governing of the Empress Elizabeth a monastery was built. In its territory was the Institute of noble maidens - the future headquarters of the Bolsheviks and the place of residence of the current city authorities. Today, getting acquainted with the creation of the architect Rastrelli, tourists can climb a 68-meter bell. To climb the observation deck, we must overcome 277 steps. From this, the highest point of view of St. Petersburg, a magnificent panorama opens with rivers and canals, palaces and parks. 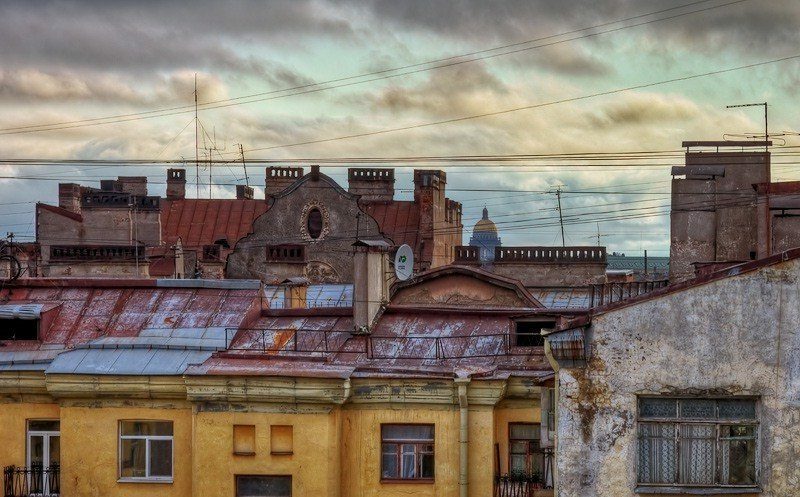 The flat dome of the Tauride Palace and the stone chimneys of Kikina, the riveted iron bridge of Peter the Great and the gloomy crosses - a red brick building with sentinel towers at the corners. Through the Neva there are visible smoking pipes of the Vyborg side, formerly inhabited by working people, Bolshaya Okhta with buildings of the gunpowder plant of Peter's times, transformed into Okhtinsky chemical plant. So, exploring the city from high points, we climbed over the lanterns and trees, over bells and domes, over turrets, weathercocks, Atlanta, over trolley wires, listening windows and water pipes. Now you can go home, taking in your heart the memory of the magnificent panoramas of St. Petersburg.